Michael Sattler's martyrdom was one of the bravest and boldest, yet he was one of the most peaceful of the radical reformers. His story is awe-inspiring. I love the radical reformers, so I've read quite a bit about them. Until recently, though, I had never read anything about Michael Sattler. Then I saw a movie called The Radicals that focused on his life. What I've been reading is better than the movie. He was a brave and bold man who left a prestigious position in a monastery to follow after Christ. He infuriated the Roman Catholics enough that when they put him to death, they cut out part of his tongue, then tore his body with tongs seven times on the way to the place of execution. None of this stopped him from praying for his guards and even the judges who had ordered this upon him. They had not cut out enough of his tongue to stop him from talking. His obstinance infuriated his executioner enough that he refused to put the bag of gunpowder around his neck that was supposed to hasten his death when he was burned. Instead he died slowly, praying and singing praises to God. The movie didn't show the prayers and the praises. Even without those, I was so moved by the bravery and love of God in Michael Sattler that I felt unworthy even to watch his story. May God grant us grace to stand for Jesus Christ as these men did. Michael Sattler was born in Stauffen, Germany sometime in the 1490's. He eventually became a monk and was prior of the Benedictine Monastery of St. Peter's near Freiberg, Germany. In May of 1525 a group of peasants marched on St. Peter's monastery in protest of high taxes. Sometime around that time, he left the monastery. Sattler married a nun (former, of course) named Margaretha, and when persecution arose, they fled to Zurich, where Felix Manz, Conrad Grebel, and Georg Blaurock were just splitting with Ulrich Zwingli. He became a part of the split, and he was banished from Zurich in November, 1525. He wound up in Strasbourg, France with Wolfgang Capito and Martin Bucer, who both became part of the Protestant Reformation. He disagreed with them on infant baptism, and they went their separate ways. 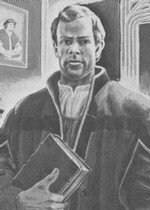 Unlike the other Anabaptists, however, Michael Sattler stayed on good terms with Capito and Bucer despite their disagreements. One of the most important documents in Anabaptist history was the Schleitheim confession, which became a sort of creed for the Anabaptists. Michael Sattler drafted the confession, along with others, at Schleitheim, Switzerland in 1527. The document drew enough attention to prompt a written response, Refutation of Anabaptist Tricks, from Ulrich Zwingli in Zurich. Not long after the Schleitheim confession, Michael and his wife Margaretha were caught by Roman Catholic authorities. He was charged with denying transubstantiation (the physical presence of Christ in the Eucharist/Communion bread and wine), denying that infant baptism saves, and with marrying after taking monastic vows. He was also charged with saying that if the Turks attacked, Christians should not resist them. In conclusion: Ye ministers of God, I admonish you to consider the end for which God has appointed you, to punish the evil, and to defend and protect the pious. Whereas, then, we have not acted contrary to God and the Gospel, you will find that neither I nor my brethren and sisters have offended in word or deed against any authority. Therefore, ye ministers of God, if ye have not heard or read the Word of God, send for the most learned, and for the sacred books of the Bible, of whatsoever language they may be, and let them confer with us in the Word of God; and if they prove to us with the Holy Scriptures, that we err and are in the wrong, we will gladly desist and recant and also willingly suffer the sentence and punishment for that of which we have been accused, but if no error is proven to us, I hope to God, that you will be converted, and receive instruction. Some of the dialogue at that commenced after Michael Sattler's defense is quite interesting. As you will be able to tell, judges in the early 16th century were not so unbiased as judges today! Town clerk: "O you infamous, desperate villain and monk, shall we dispute with you? The hangman shall dispute with you, I assure you!" Sattler: "God's will be done." Town clerk: "It would be better if you'd never been born!" Sattler: "God knows what is best." Town clerk: "You arch-heretic, you have seduced the pious; if only they would forsake their error and accept grace." Sattler: "Grace belongs to God alone." Town clerk: "You desperate villain and archheretic, I tell you if there were no hangman here, I would hang you myself, and think that I had done God service." Sattler: "God will judge rightly." There were others with Michael, and they were prepared to be as bold as him. When one of the people in the room began to insult Michael and worked himself into such a frenzy that he picked up a sword and threatened Michael, one of the other Anabaptists warned Sattler, "Don't throw your pearls before swine." Michael didn't. He endured the sentencing in silence. They then cut out his tongue, as I mentioned above, tore him with tongs, and then burned him to death. Margaretha was not treated so severely as Michael. She was drowned in what authorities liked to call "death by baptism." I should note that Martyrs Mirror says he was only torn twice with tongs, though everything else I've read has said seven. I don't suppose that changes the story much.